Method for sponge: Preheat oven to 180 degrees. Grease two 8 inches sandwich pan and line with butter paper. Beat eggs till light and fluffy gradually start adding in sugar. Beat well till mixture double in volume. Sieve together flour, coco and baking powder. Add vanilla essence to egg mixture. Stop beater and fold in the dry ingredients. Very gently spread mixture into prepared pans. Bake on 180 degrees for 20 to 25 mins. Remove cake from oven. Cool and remove on a cake platter. Moisten cake with any food syrup. Spread with fresh cream. Top with peaches and cherries. Cover with second sponge. Moisten with fruit syrup. Cover the sides with whipped cream. 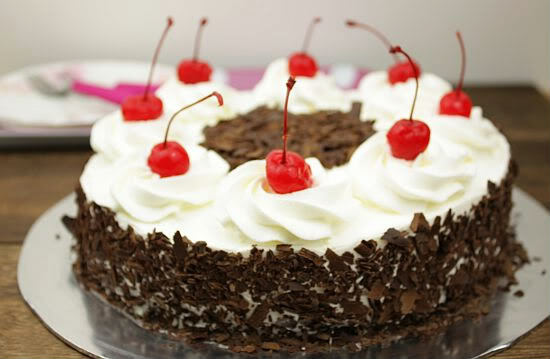 Drizzle with chocolate sauce and decorate with cherries. Serve chilled.